Who doesn’t like a nice day out with the family? A stroll in the park, a day of fishing, maybe a baseball game on the green: These are all great ways to spend quality time with your kin. And a great place that offers places to enjoy all of those experiences is Bayonne, New Jersey. With the Hackensaw RiverWalk and other great parks, Bayonne proves to be a fun, safe, and beautiful place to live and raise a family. If you live in such a beautiful area, then it comes to reason that you should maintain a beautiful house there. And to maintain the MOST beautiful house possible, consider getting marble tile installed within it. If you are looking for quality marble and tile in Bayonne cut to your exact specifications, then don’t hesitate to call on the pros at Kennedy Tile & Marble Inc. today! MARBLE TILE IN BAYONNE, NJ. Why should you choose marble for all of your tile needs? For many reasons, actually! Marble is beautiful, for one thing. For another, it is durable and long-lasting, meaning you’ll enjoy its beauty for many years to come. On top of all that, marble is resistant to water damage, so it’ll keep your home and, by extension, family safe from wood rot and mold growth. If you are in the market for quality marble for your tile needs, don’t hesitate to call on Kennedy Tile & Marble Inc. today. We can supply you with top-quality marble at a great price guaranteed. Don’t settle for less than the best when it comes to your marble materials — GET the best! And you can get it with Kennedy Tile & Marble Inc. CUSTOM STONE FABRICATION IN BAYONNE, NJ. 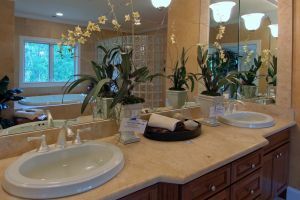 Of course, for all of your marble needs — tile, flooring, backsplashes, countertops — you’ll need to have that marble CUT to fit the places you need it to fit. After all, marble doesn’t naturally grow in the dimensions and at the angles you might need it to grow in! To get it to fit those dimensions and angles, you need to have your marble fabricated by an experienced expert — such as the folks at Kennedy Tile & Marble Inc. We at Kennedy Tile & Marble Inc. can fabricate marble — or any stone you need — to suit all of your home-improvement needs!